We are delighted to share with you the latest issue of the publication from Herbert Smith Freehills' Global Arbitration Practice, Inside Arbitration. 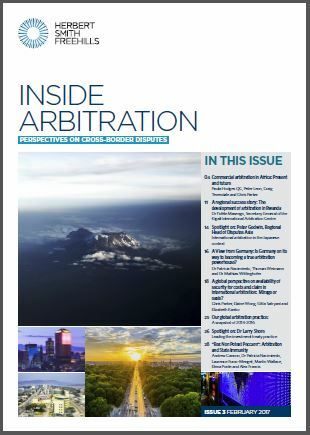 In addition to sharing knowledge and insights about the markets and industries in which our clients operate, the publication offers personal perspectives of our international arbitration partners from across the globe. Paula Hodges QC, Peter Leon, Craig Tevendale and Chris Parker share their insights into the development of commercial arbitration on the African continent and consider dispute resolution choices for parties negotiating Africa-related contracts. We consider the development of arbitration in Rwanda and the Kigali International Arbitration Centre "in conversation" with KIAC's secretary general, Dr Fidèle Masengo. Peter Godwin, Regional Head of Disputes Asia, reflects on his 16 years in Asia and the changes in attitudes towards dispute resolution amongst Japanese parties. Dr Patricia Nacimiento, Thomas Weimann and Dr Mathias Wittinghofer give their view on whether Germany is on its way to becoming a true arbitration powerhouse. Chris Parker, Elaine Wong, Gitta Satryani and Elizabeth Kantor provide a global perspective on the availability of security for costs and claim in international arbitration. Dr Larry Shore discusses his path into public international law and the development of his interest in treaty disputes, as well as the differences in arbitration practice in the US and the UK and trends in US arbitration. We highlight a number of key considerations for parties negotiating contracts with state and state-owned entities across the globe and provide comparative into state immunity in five key jurisdictions. We are pleased to present our clients with an infographic providing a snapshot of our global arbitration practice in the two years 2014-2016. The infographic details the successes of our growing practice and our huge geographical reach. The infographic is available at this link and at page 25 of Inside Arbitration. We hope that you enjoy reading Issue #3 of Inside Arbitration. We would welcome your feedback.